Technology is in a constant state of flux. Different industries like gaming, health-care, manufacturing, construction, etc. are making use of this constant evolution in technology to improve the way they function. Technology is also playing a huge role in the education sector. One of the things it is doing is helping the teaching community to perform its role better. To support it there are many useful software for educational institutions. Teachers can not stay away from technology specially when even kids are improving using kids learning apps. Teachers are leveraging technology to collect and record student reports and behavior which can later be analyzed to see where they’re strong and where they’re going wrong. This is helping teachers create personalized paths to help students with their studies, knowledge and skills; thereby improving their future. According to a study conducted by Harvard University, teacher-parent communication is the key to a student’s success. However, the biggest problem teachers’ face is getting parents involved in the day-to-day activities of their children and monitoring their progress at school. A San Francisco based start-up came up with a solution for this problem. It’s come up with Remind, a free iPad app that lets teachers send reminders, assignments, homework, assessments or motivational messages to parents and students. Teachers can even schedule messages or reminders ahead of time with this app. Apart from its amazing features, the main reason this app is quite popular with teachers and parents is - ‘security’. This app ensures interactions between parents and teachers are safe and secure by keeping phone numbers private. It is extremely important for teachers to manage student behavior. This excellent free app comes in handy; it allows teachers to manage their classes, create and view data and reports on student behavior and share these reports with parents and administrators by printing or emailing them. This app helps improve student behavior and engagement by providing real-time feedback. Teachers can either set it up for individual students in a class or for the whole group to track expectations or group norms. Flashcards are an effective part of teacher’s curriculum as they can speed up the learning process for students. This is an app that offers digital flashcards to help 21st century students cement their knowledge and learn quickly. This app interconnects teachers and students; it allows teachers to create custom sets of flash cards within the app and share them immediately with their students. This app has robust search features with an extensive library of flash cards available on a wide array of subjects. It even lets students track their progress, share flash cards with other classmates and set reminders to keep them on the right track. It also easily syncs with Facebook, Twitter and Evernote. Blogging is a highly recommended activity for students as it is very productive. However, blogging platforms like Blogger or WordPress require students to know coding or HTML. Kidblog simplifies this for students by allowing them to write a blog with photos and videos directly from their iOS device without the need to embed code. In the age of digital insecurity, privacy and safety is an important concern for everybody. This app ensures student blogs are only viewed by the teacher and classmates. What more, as an added bonus, it is totally free to use! This widely used app is worth a look if you are having trouble tracking your tasks. It is a one-stop app to keep track of attendance, behavior and grades; these features make it a must-use app for teachers. The interface of this class-management app is user-friendly and offers top-quality UX to teachers. The biggest benefit of this app is that it allows teachers to focus on teaching rather than worry about all the administration work. It is basically a free app. But, it offers premium membership, if you want to upgrade its features for giving a further boost to your efficiency as a teacher. Say goodbye to traditional white board and chalk! Yes, this iPad app makes it possible for teachers to easily create and share presentations with students. Also, if you prefer, you can add audio to your creations and use it as a teaching tool. It even lets teachers see who viewed the presentation and when. This digital interactive whiteboard offers clean and intuitive design which minimizes distractions - making presentations an easy job for teachers. 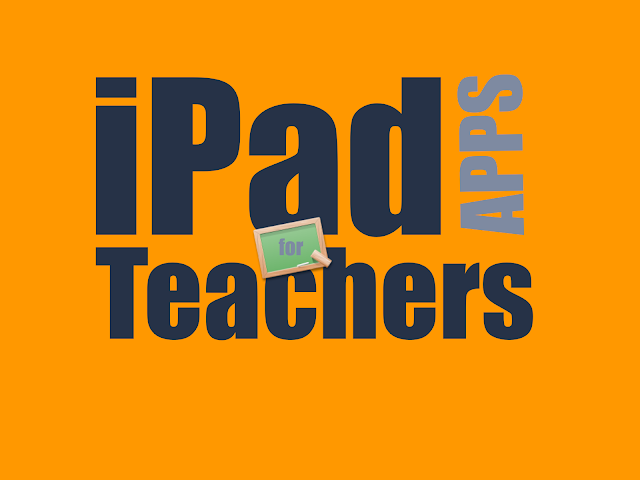 This is a game changing app for teachers. It is an app that is appropriate for educational use in a wide range of subject areas like physical and regional geography, earth sciences, etc. Educators can make it available for students for inquiry-driven activities. Teachers can employ Google Maps directly as a presentation tool for classes or as a means of saving graphics, for use in lectures. Google Maps for Education - presents advice on how to use Google Maps, Google Earth and Google Street View in educational settings. This is another important app for classroom management. It’s a complete standalone solution that enables educators to record grades, attendance and student performance. It is a powerful and easy-to-use app that ensures efficient class management. It supports both weighted and standard (point-based) grade scales. From the app, teachers can upload grade or status reports to Dropbox or email them to students and/or parents. This app provides users with a launch pass code ensuring all information in the app is highly secure. In a nutshell, GradeBook Pro is a robust app that offers all the features a teacher is looking for in today’s tech world. This one is an amazing app that lets teachers set homework and classwork activities for students to complete. This app enables teachers to share study resources with their class and students to work on group projects. It also lets teachers and/or students initiate discussion threads and debates. It is basically designed to help students increase classroom participation, brainstorming and memorization. ExamTime allows students to create multiple resources such as Mind Maps, Flashcards, Quiz Maker and Interactive Notes. It also offers over 1 million learning resources for students. This app works online and offline; once the learning resources have been downloaded by students, they can access these even when they are offline. It’s an amazing cloud-based app for classroom teaching with an iPad. It lets teachers create short lessons and deliver them to students. GoClass gives teachers tools for creating class rosters that they can use to keep track of ‘lessons’ usage by students. Teachers also have the option to ask questions and poll their students. GoClass lesson plans are organized into three distinct sections--Show, Explain & Ask. The app also allows teachers to populate and organize images, documents, videos, URLs, teacher notes and assessments into a structured sequence. These are just a few of the many great apps tailor-made for educators If you are using others that you believe are great for teachers, share your recommendations in the comments section below! Vivek Patel is the content marketer at MoveoApps, an iPad app development company. He writes about mobile applications, technology and analyzes current technology market scenarios and loves to share his ideas on the web. You can follow him on Twitter @VivekrPatel.